You are what you eat, and that means that the food you eat has a big impact on your health. 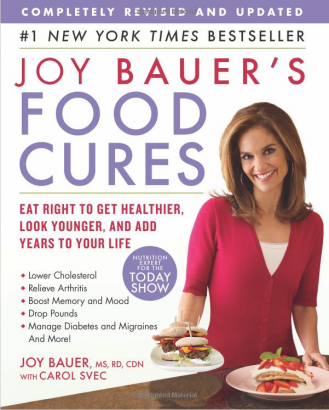 In the book, “Joy Bauer’s Food Cures”, advice is offered on what specific foods you should be eating to help various health problems. The first part of the book is an overview of Joy Bauer’s philosophy (Life is hard… food should be easy), with tips on how to use the book and how to think like a nutritionist. The following chapters cover different health problems. Each one includes information on the medical problem, foods that are good and bad for it, along with a listing of vitamins, minerals and supplements that might be useful for that particular issue. The basics are the first things recommended to get the problem under control. These steps are the baseline of what needs done. The grocery list contains a listing of the foods that are found to be helpful for that particular health issue. Above and beyond has tips on supplements that might be useful, and other helpful things. Meal plans have several options for breakfast, lunch, dinner and snacks. Each section also has a few recipes using the recommended foods. Of course, the number one health problem addressed is losing weight. Pages 17 through 59 of the book are about weight loss and comprise the largest section of the book. During the past 20 years, there has been a dramatic increase in obesity in the United States and rates remain high. In 2010, no state had a prevalence of obesity less than 20%. Thirty-six states had a prevalence of 25% or more; 12 of these states (Alabama, Arkansas, Kentucky, Louisiana, Michigan, Mississippi, Missouri, Oklahoma, South Carolina, Tennessee, Texas, and West Virginia) had a prevalence of 30% or more. When you consider 20 years ago NO state had an obesity level above 15% in the population, and today there are 38 states with obesity levels over 25%, the statistics pretty well speak for themselves. We are fat, and getting fatter all the time. So anything that will help this problem is good! There are about 15 pages of meal plans, with a couple of recipes in addition. This section is filled with good information, and you could certainly devise a diet plan using this and nothing else. The next section of this book has recommendations on how to have beautiful skin, healthy hair, and good dental health. There are about 54 pages devoted to these subjects, with information on the foods that help achieve health in these areas. Each section follows the same format with information about the medical problem first, foods to avoid and foods that are good, the supplements which might be helpful, and then the 4-Step Program for good nutrition for that health issue. The last part of the book has a section on “Decoding a Nutrition Label” that shows you how to tell what each part of the labels on grocery store foods mean. That takes about three pages, then the rest of the section is an extensive list of references for the information in the book. Considering the size, it’s obvious a lot of research went into the work! This book is advertised as having “cutting-edge research and expertise” information. However, how “cutting edge” this book is depends to a great extent on your point of view. To me, the cutting edge is more “out there.” Information that is cutting edge is often hailed as great news or a bunch of quackery. If you are reading work by such people as Dr. Daniel Amen, Dr. Joseph Mercola, Dr. Mark Stengler, Dr. Jacob Teitelbaum, Dr. Andrew Weil, and others, you are more likely to be reading about the cutting edge of using foods and supplements for preventative and curative health measures. “Food Cures” is a solid reference guide written in easily understandable language for the average reader. It would be a great read for someone new to the idea of how certain foods can be helpful for medical problems, and has good overviews for the medical problems listed. The format is good if you are looking for the best foods for a specific problem. However, because some foods are good for a lot of different things, there is some repetition in the book as you go from section to section. Although the book does include recipes, it is not a cookbook. The recipes are scattered throughout the book, and that makes it difficult to find what you want sometimes. The bottom line, if you want a good overview of using foods for better health, this book has that and is easy to read. It would be a nice reference work to include in anyone’s library with good, solid information. When you want the basics, they’re there is an easy to find format.